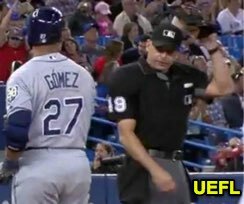 HP Umpire Andy Fletcher ejected Rays PH Carlos Gomez (strike three call; QOCN) in the top of the 6th inning of the Rays-Blue Jays game. With two out and the bases loaded, Gomez took a 2-2 fastball from Blue Jays pitcher Tim Mayza for a called third strike. Replays indicate the pitch was located off the inner edge of home plate and above the knees (px -.954, pz 1.766 [sz_bot 1.599]), the call was incorrect. * This ejection was not reported in the box score, but added pursuant to UEFL Rule 7-2 regarding disputed or erroneous information. At the time of the ejection, the Rays were leading, 3-2. The Blue Jays ultimately won the contest, 9-8. This is Andy Fletcher (49)'s sixth ejection of 2018. Andy Fletcher now has 8 points in the UEFL Standings (10 Prev + 2 MLB - 4 Incorrect Call = 8). Crew Chief Jeff Nelson now has -1 points in Crew Division (-1 Previous + 0 Incorrect Call = -1). This pitch was located 0.48 horizontal inches from being deemed a correct call. Following his ejection, Gomez took to Twitter to criticize Fletcher. This is the 171st ejection report of the 2018 MLB regular season. This is the 81st player ejection of 2018. Prior to ejection, Gomez was 0-1 (SO) in the contest. This is Tampa Bay's 3rd ejection of 2018, T-5th in the AL East (TOR 10; NYY 9; BOS 5; BAL, TB 3). This is Carlos Gomez's first ejection since September 3, 2017 (Mike Estabrook; QOC = N [Balls/Strikes]). This is Andy Fletcher's 6th ejection of 2018, 1st since Sept 7 (Bud Black; QOC = Y [Balk]).